Environmental, political, and corruption crises have collided to threaten the core of Mongolia's democracy. Protesters filled Sukhbaatar Square, an open space in front of the Parliament building in downtown Ulaanbaatar (UB), the capital of Mongolia. As the temperature dropped below negative 20 degrees Celsius, they demanded the resignation of Mongolia’s parliamentary speaker and former mayor of UB, Enkbold Miyegombo. These protests were precipitated by interdependent crises: a political crisis of trust in the government, recently inflamed by a corruption scandal, and a chronic air pollution crisis. At the same time, Mongolians suffer from a miasma of corruption and state incompetence. MANAN, the Mongolian word for “fog” is also the acronym of the two major political parties, the Mongolian People’s Party (MAN) and the Democratic Party (AN). It is a telling coincidence. Democratic elections generate their promises, expectations, disappointment, and resignation, punctuated by the periodic corruption scandal. The most recent scandal involves the Small and Medium Enterprises Development Fund (SME), meant to provide low-interest loans geared toward diversifying Mongolia’s domestic economy and loosening its reliance on export-oriented mineral extraction. In November 2018, investigative journalists revealed that the majority of the companies that received loans were tied to prominent politicians, often via family members, friends, and elaborate shell companies. Similar to air pollution, corruption — colloquially referred to as “money-eating” — is also viewed as a theft of the future. Despite pervasive anger over the unabated air pollution, last week’s protest was specifically triggered by multiple corruption scandals. Enkbold, as head speaker of the Parliament, is viewed by many as representative of the endemic corruption within Mongolia’s political institutions. 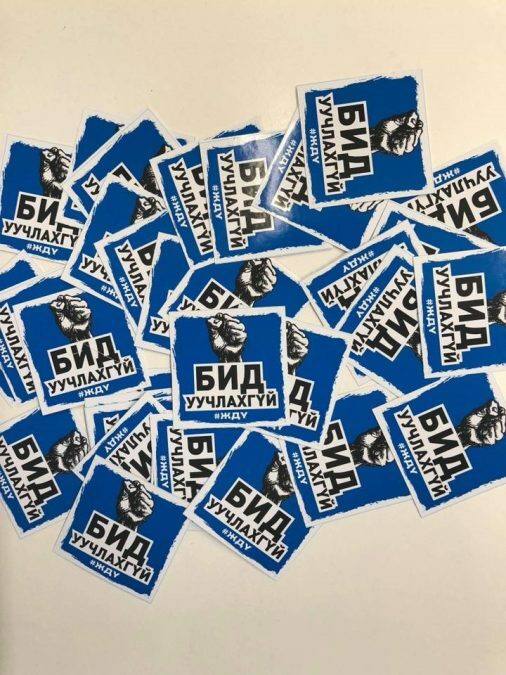 However, speculation is also rife that the protests against Enkbold are part of a shadowy campaign orchestrated by Enkbold’s intra-party rival, current Prime Minister U. Khurelsukh (MPP) who survived a no-confidence vote this past November. 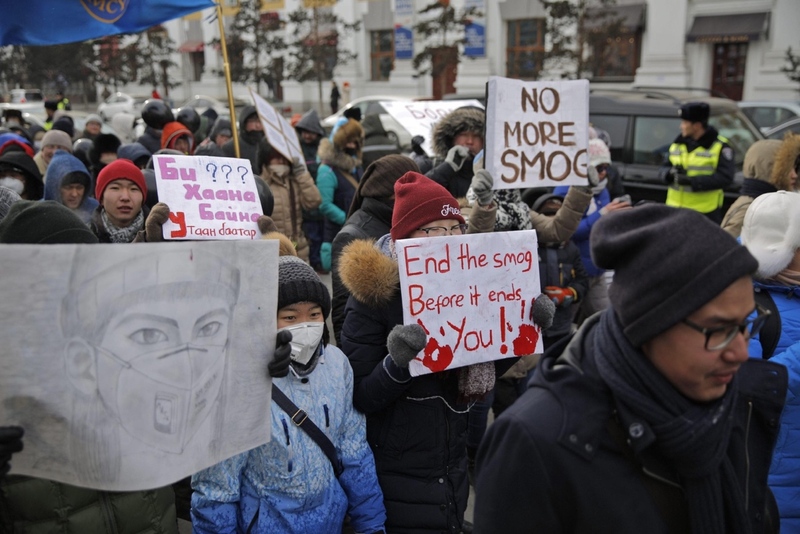 Despite allegations of conspiracies, the complaints against Enkbold resonate with many Mongolians who are frustrated with the state’s inability to address widening socioeconomic inequality, catastrophic air pollution in the capital, and the population’s general well-being. But it is important to realize that the state’s incapacity is not due to a lack of money or resources, but their inability to generate socially desirable results, which is why corruption has become such a volatile political issue. If one looks at development reports, political risk indicators, or investment climate projections concerning Mongolia, corruption is cited as one of the country’s biggest outstanding issues. Moreover, constant rumors of backdoor deals feed a public perception of pervasive corruption. It wasn’t until the SME scandal, however, that solid systematic evidence emerged to confirm these popular narratives. Although Enkbold was not named in the SME scandal, he was directly implicated in a scandal that broke before the 2017 presidential election in which he was a candidate. An audio recording was leaked to the public of a conversation from 2014 allegedly between Enkbold and other high-level members of the MPP regarding a “60 billion tugrug” (about $25 million) deal to pre-sell government positions as part of an election financing. No matter that the Mongolian Justice Department ruled the recording “fake.” Scandals which resonate with previously held beliefs are nearly impossible to refute. By the time they’re investigated and ruled on, they’ve already undermined the public’s trust in politicians, and political institutions in general. The problem is that corruption is a realistic approach to political financing given the design of Mongolia’s political economy and party system. A defining feature of Mongolian democracy and politics is the pervasiveness of patron-client networks within and across all major political parties. Unlike developed countries with a large revenue base and ability to collect taxes and transfer income and public goods to constituencies, in a developing country such as Mongolia the state only collects about 18 percent of its very small national income. There is very little left for redistribution after expenditures on salaries of civil servants, subsidies, and social security services. As a result, political mobilization in Mongolia is done through off-budget resources (such as foreign aid, loans, and sovereign bonds), creation of rents (ranging from the distribution of mining licenses to tenders of elementary school textbooks), and through funds that are used to pay off supporters of the factions in power. In this perspective, corruption is not parasitical on the state, it is what keeps it functioning. Due to these structural reasons, anticorruption efforts in Mongolia are largely ineffective. Formal state institutions lack the political will to tackle corruption as they are the primary trellises upon which patron-client networks flourish. Take the SME scandal: a fund was established through which money was siphoned away from its intended beneficiaries and redistributed to political elites and their families. To crack down on corruption would be to turn off the tap on party finances and desiccate the elaborate networks of patronage. Despite Mongolia’s formidable anticorruption legal and administrative framework, it has not achieved enough to diminish popular perceptions of endemic corruption. In many respects, anticorruption reforms and the creation of parallel institutions and task forces are not primarily designed to eradicate corruption but to satisfy foreign donors’ scorecards and maintain a veneer of democratic legitimacy. But this raises the question: if corruption is an entrenched and enduring part of Mongolia’s political system, why are the protests happening now? Why were there no mass demonstrations two years ago, after the revelation that “sixty billion tugrugs” were allegedly spent on political appointments? Are the current protests simply a ventilation of accumulated anger and frustration? Or, is something — or someone — else stoking the embers of popular anger? We cannot definitively answer these questions. But it’s worth noting the involvement in the protests of fellow members of Enkbold’s ruling MPP in tandem with two members of the opposing DP (one of whom, MP Batzandan, was removed; the other, MP L. Bold resigned voluntarily before the demonstration). The leader of the demonstration, MP Oyunerdene, also happens to be a close friend and protégé of U. Khurelsuk, the current prime minister who just survived a no-confidence vote. There is also speculation of the involvement of President Battulga whose Trump-esque campaign slogan “Mongolia will win” has been adapted to sarcastically describe his followers as “winners.” The emergence of a cross-party faction attempting to topple the government points to serious rifts within Mongolia’s ruling class. Since the protests began late in December, cohesion among Mongolia’s political elites has further disintegrated. Protests have continued into the new year, and several parliament members, buoyed by the support of various organizations — including a far-right ultra-nationalist group Bosoo Höh Mongol (“Standing Blue Mongolia”) and popular movement People’s Anti-Offshore Committee (Ard Tumnii Onts Zövlöl) — have declared a hunger strike, demanding Enkbold’s resignation. The public demand for anticorruption has become a means of inter-, and intra-party political infighting. In the last week, rumors have swirled that former finance minister S. Bayartsogt is about to be detained, and that President Battulga requested the general prosecutor’s office to investigate his predecessor, the former president Elbegdorj. As the rifts between political elites widen, it seems no one is safe from falling in. Does this mean that the whole political system is in irreversible crisis? The recent attempts to use the general prosecutor’s office and Independent Authority Against Corruption as mere tools in a mundane intra-party conflict indicate a breakdown of formal institutions. Given their collapse, informal political power will become even more important, as fights over strategically important mines such as Erdenet and Tavan Tolgoi intensify. The core of Mongolia’s democracy, then, is endangered. But even if such fractures exist, the prospect of significant political change is obscured by the fog. From the perspective of many ordinary Mongolians, Enkbold’s resignation on its own would not solve the corruption problem. In the words of a local resident: “If Enkbold and his cronies left, a new set of people would sooner or later take their place.” The prevalent feeling that the state is a conduit for corruption is expressed in the popular phrase that the politicians move through a “corridor of injustice” in which deals are hidden from public scrutiny. The perception that most politicians are interchangeable is not only due to endemic corruption. It’s also symptomatic of the global trend described by the late political scientist Peter Mair as the “hollowing of democracy,” in which political parties no longer represent distinctive ideological platforms nor give voice to the needs and aspirations of their constituencies. In the 2017 presidential election, dissatisfied with their lack of choices, about 1.5 percent of voters organized to cast a blank ballot. The white ballot was not merely symbolic; if neither candidate received an absolute majority in the second round of voting, Mongolian electoral law would have required the parties to select different candidates. The problem goes deeper than lackluster individual politicians and touches the core of the party system itself. Between the MPP and DP, there are no discernible differences in vision, platform, or policy. They differentiate themselves only through vague semantic hairsplitting and mutual recrimination. When political parties are interchangeable, voting is reduced to the repeating compulsion to punish the incumbent. According to the sociologist Julian Dierkes: “When you line up MPP policies and compare them to DP policies, there is no ideological pattern to be found in either and voters would be unable to guess what position these parties would take on particular initiatives or challenges in the future.” Here fog takes on an additional meaning of indistinction and loss of a political horizon that could provide an alternative, or any, orientation. Mongolia’s unfolding political crisis is ultimately a crisis of democracy. One of the slogans to emerge from the corruption scandal is: “We will not forgive.” To forgive would be to reset the clock and start again. Like Bill Murray’s character in the movie Groundhog Day, it would be to begin each day with the knowledge that one is stuck with no ability to change it. Regardless of whatever you do that day, the next day when you wake up, the same script will play itself out. To withhold forgiveness, however, is to hold open the possibility of a future beyond resignation — a protest against what Lauren Berlant refers to as “crisis ordinariness.” According to Berlant, the language of crisis and urgency can merely become “a way of talking about what forms of catastrophe a world is comfortable with or even interested in perpetuating.” It may generate discourse, outrage, compassion, and hand-wringing without actually changing anything. Elections come and go like seasons. Corruption scandals are like passing storms. But the fog will never clear on its own accord. Christian Sorace is an assistant professor of political science at Colorado College. Sanchir Jargalsaikhan is director at the Sustainable Development Strategy Institute.